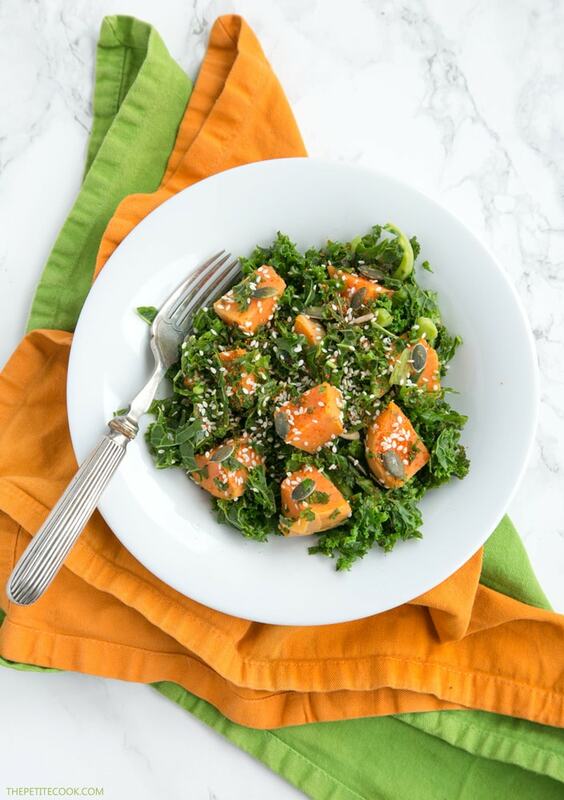 Awesomely healthy and fulfilling, this Spicy Sweet Potato and Kale Salad is packed with nutrients and both gluten-free and vegan – The perfect warm salad anyone can enjoy on a chilled day! 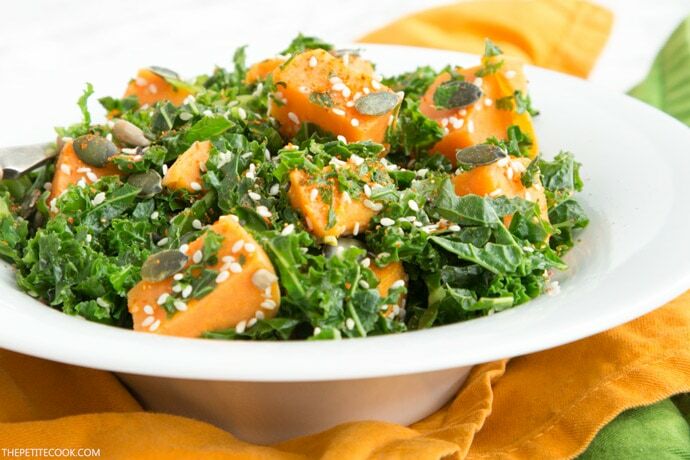 I haven’t posted a salad recipe in a long time, so I thought, what better occasion than Veganuary to share with you this awesome warm Spicy sweet Potato and Kale salad? I’m totally obsessed with this salad lately, so now that I’m finally sharing it with you, hopefully I can move on for a while and eat something else. Because that’s what usually happens to me when I get obsessed with a recipe or some particular food. I just keep eating it over and over and over again. And I don’t get tired of it for months. 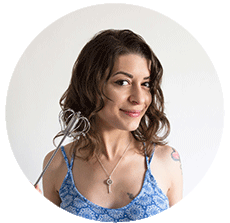 But you know, I’m here to create recipes, so can’t really get stuck into eating kale salad forever, can I? 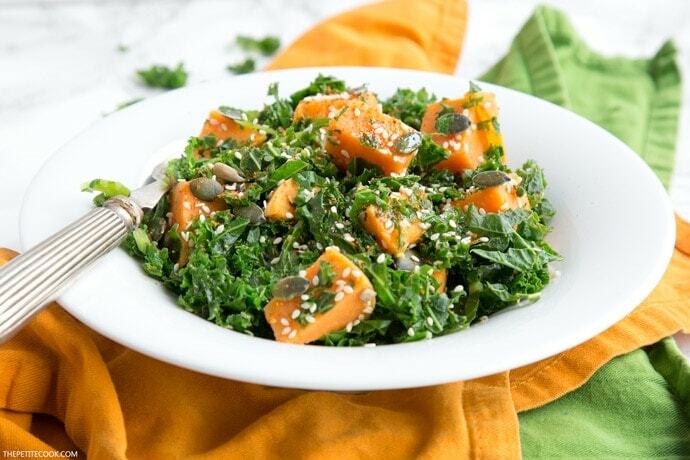 This Spicy Sweet Potato and Kale salad is ready in just 15 min and requires only 6 ingredients to make: sweet potato, kale, sesame seeds, pumpkin seeds, shichimi pepper and a good extra virgin olive oil. The spices and seeds bring this salad to the next level. I usually go for Japanese shichimi to get that extra spicy kick, but you’ll be totally OK using a pinch of chili powder or hot paprika. Smoked sea salt flakes, sesame seeds and pumpkin seeds give a nice crunchiness, which contrast very well with the soft sweet potato. There are multiple reasons why I love this Sweet Potato and Kale salad: it’s heart-warming, wintery, effortlessly easy to make, has a great crunchy texture and is super versatile. When I’m not simply enjoying it on its own, I like to serve this salad with roasted chicken or grilled fish ( king prawns also work amazingly well), but experiment with what you like. You can also keep it vegetarian by throwing in some chickpeas or quinoa, or topping it with a poached egg ( my favorite way). 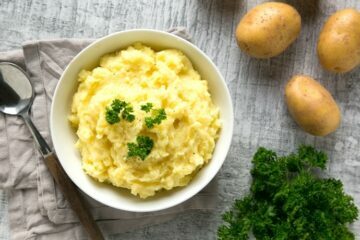 This dish is incredibly simple to make, and I recommend it for anyone looking for a quick, light and fulfilling meal! 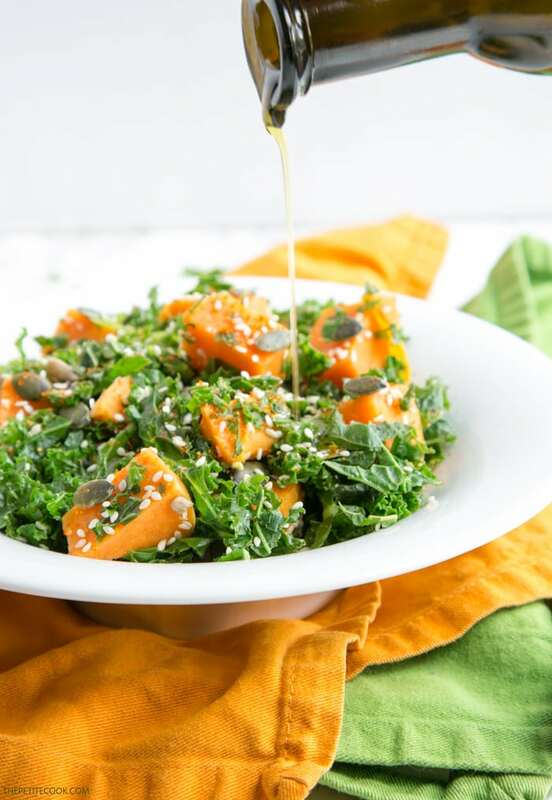 Healthy and fulfilling, this Spicy Sweet Potato and Kale Salad is packed with nutrients, dairy-free, gluten-free and vegan - The perfect warm salad to enjoy on a chilled day. Put sweet potato cubes in a steamer and steam for 7 min. Add in chopped kale and steam for a further 3-4 min. In a large bowl, add in cooked sweet potato and kale, then fold in sesame seeds, pumpkin seeds, smoked sea salt flakes and shichimi pepper. 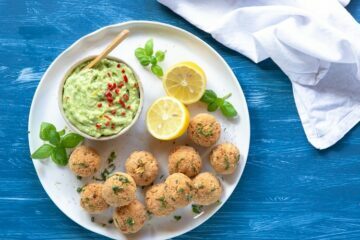 Arrange on a serving plate and season with a glug of extra virgin olive oil. Wow that looks beyond lovely, and so colorful. Definitely a good way to distribute in front of others. Your salad looks so fresh and light and ideal for Veganuary as well as healthy intentions for the year ahead. 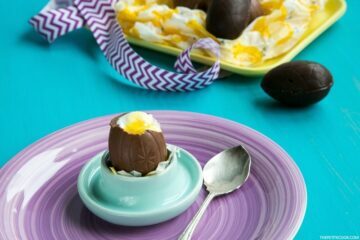 Will try this, thanks for the recipe! What a lovely salad. It’s perfect for Veganuary and I love the addition of the seeds. Yum!